The luxury car brand which tapped Seinfeld for their Superbowl commercials last year is now sponsoring his Web-based show. Does this mean that Comedians won't have anything but Nissans to drive in? One of the greatest things about Comedians in Cars Getting Coffee are the cars that they go get them in. Many are from Seinfeld's own collection, others are from admirers and friends and occasionally they're from the comedic guests themselves. They're almost always interesting to see driving around, even if the conversation and humor isn't as good. So will all of that change now that the next season of the show is officially sponsored by Acura? That's a good question. The press release for the announcement says that the previous work Seinfeld did with Acura on their 2012 Superbowl commercials laid the groundwork for this obvious meld of synergy. Or something. Now the company is stepping up to sponsor the next season of the show, which appears on Cracked during the summer and re-publishes on places like YouTube. 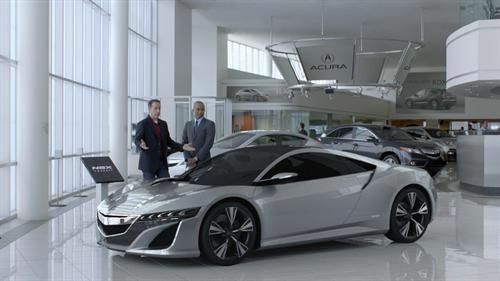 "We love Jerry's unconventional, fan-first approach of creating great content and trusting that the right people will find it," said Mike Accavitti, Acura Senior Vice President of Auto Operations. Well, the good news is that this won't change what vehicles are seen on the show. Outside of commercials, anyway. According to Comedians, the show will continue featuring its own cars as it did in its first season, but will have "bumper ads" specifically made for it to advertise Acura. We can assume a lot of those ads will feature Seinfeld and perhaps some of his guests. The show itself appears to be popular. Not appearing on television, but only on the Internet, it has managed to be streamed more than ten million times since the first episode went on air. The show is wildly successful, playing on a mix of car lovers, nostalgia (most of the guests are, shall we say, "old"), and supposedly candid conversations on both fronts. Its success is obvious, even if it doesn't appeal to all of us.